Angry Birds Tops Half-a-Billion Downloads: What's Next? Rovio's mega-popular "Angry Birds" game has surpassed 500 million downloads, an astounding achievement for what was already the world's most popular mobile game. In fact, Angry Birds devotees worldwide play 300 million minutes of the game every day, the company says. Well, enough accolades, already. Aside from the usual spinoffs and plush toys, where do these revenge-seeking avians go from here? And is there a potential for backlash from a weary fan base? Here's how the Angry Birds franchise may evolve. One is already in development, it appears. Fine, but what about sequels? Perhaps a retelling from the pigs' perspective? The pilfering porkers may have a perfectly justifiable reason for stealing those eggs, you know. Their snorts and taunts? Just symptoms of bronchial infection brought on by excessive inhalation of bird poop. And if this family-friendly fare doesn't fly, there's always the horror genre. How about a slasher flick featuring the evil monkeys from Angry Birds Rio? Imagine the potential for those staged clashes and conspiracies that reality TV viewers adore. The backstage back-pecking. The Yellow Bird's prima donna antics. Who knows, maybe the loony Boomerang Bird has a substance abuse problem. King Pig? Cross-dresser. Rovio's already brought us Angry Birds Seasons and Angry Birds Rio. Don't think for a minute they'll stop there. And when the idea well runs dry, the crossover titles will start to appear. If you enjoyed Alien vs. Predator, you'll love Grand Theft Auto: Angry Birds Jacked My Ride. Hey, Rovio, what's up with all the savage pork pummeling? 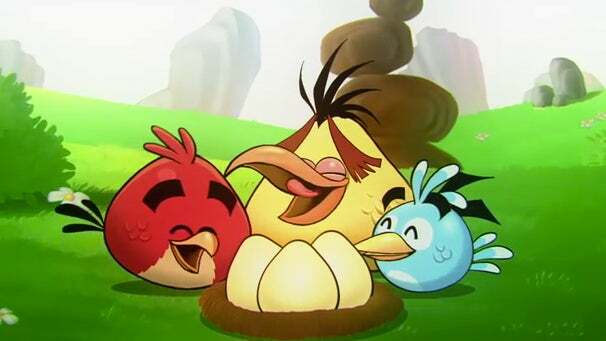 Animal rights groups will soon demand an Angry Birds overhaul. Perhaps a new character, Forgiving Bird, could slingshot kisses at the pigs? That Fat Red Bird (aka, Big Brother Bird) could shed a few pounds. A series of Weight Watchers ads shows the Bloated One eating a sensible diet could spur Angry Birds' fans to rethink their diet and exercise habits. This one's bound to happen, sooner or later. Watch for Angry Birds-themed rides at Disney parks worldwide. And yes, Disney, unlike Rovio, will totally sue the pants off China for copyright infringement.